Embark on a quintessential California road trip with this customizable full-day tour down the Pacific Coastal Highway from San Francisco. 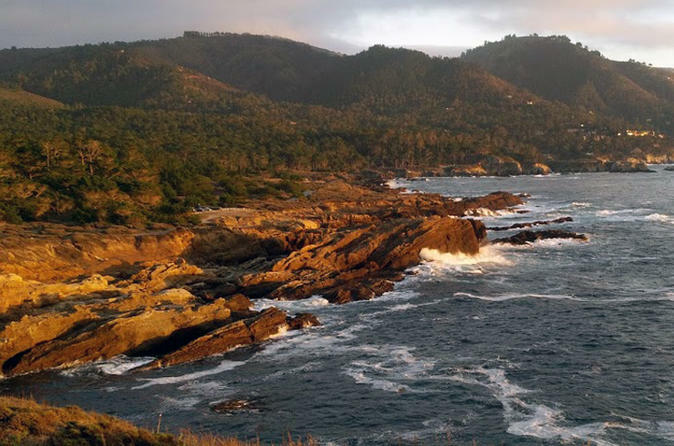 See the Big Sur coastline, visit the Monterey Peninsula — famous for its bay views, abundant marine life, and historical Cannery Row — and stroll around the top-rated destination of Carmel-by-the-Sea with your private guide. Pricing is per group, based on a maximum of six people. Upon pickup from your San Francisco hotel or the airport, let your guide know of any personal interests or preferences in order to customize your private, half-day itinerary. Set off down the Pacific Coastal Highway, aka Highway One, for several popular destinations south of the city. Your guide takes you to the bayfront town of Monterey, located on the central coast. Perhaps rent a kayak on the Monterey Bay National Marine Sanctuary in search of abundant wildlife including sea otters and harbor seals that frequent these waters. Or stroll the scenic path of Cannery Row and Fisherman’s Wharf. Moving on to Carmel, you have your choice of shopping boutiques or miles of sand to explore such as Carmel River State Beach. Departing this artist’s enclave, pass by cypress-covered hillsides along the rugged coastline toward Big Sur. Cross Bixby Bridge and ask your guide to pull over at vista points and beaches along the scenic route, such as Point Lobos State Reserve or Point Sur Lighthouse. Afterward, relax on the return drive to San Francisco.